Former Aston Villa chairman Sir Doug Ellis does not regret selling the Premier League club to Randy Lerner and says the American is a "good man". Villa are bottom of the table, 12 points from safety with seven games left, and without a manager after parting company with Remi Garde. Lerner, who bought the club from Ellis in 2006, has been criticised for not backing Garde in the transfer market. But Ellis said Lerner put his "money where his mouth is" by buying the club. Asked on BBC Radio 5 live if - with the benefit of hindsight - he would sell to the American, the 92-year-old said: "Yes, I would." 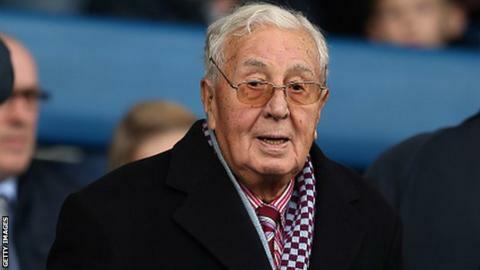 Ellis, who had two spells as chairman at Villa Park, sold the club to Lerner for £62.6m. Lerner, 54, put the club up for sale last May. "When I did the deal with Randy, he made it clear he wouldn't be able to come to many matches and he certainly hasn't," said Ellis. "I said I'd be there for him at any time because I left £20m in for new players. Consequently he hasn't asked." Villa, who have lost their last six games, host Chelsea on Saturday (12:45 BST).